Comprehensive review of Loreal Sublime Bronze Self Tanning Mist. See what real experts and actual users have to say about this self tanning product. 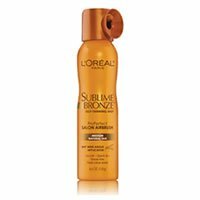 I gave Loreal Sublime Bronze Self Tanning Mist 3.25 out of 5 stars. For a drugstore self tanner this one is pretty good, although there are a few things I don’t like. First off, application gets pretty messy. We’re talking residue all over the floor…it stained the bottom of my feet pretty bad! I also don’t like the smell of this one…it smells like straight DHA. The color it produced was really nice; I was a bronze medium to dark shade. It looked like I spent a week in the sun. Although the color looked great, after about 3 days it faded very scaly and splotchy. You can’t beat the 5 minutes drying time…. or the cheap price tag. Loreal Sublime Bronze Self Tanning Mist is a light, clear colored mist. There’s no guide in this mist and you can’t see it going on your skin because the mist is SO fine. This one is easy to apply, but your bathroom will get messy! Since this is a mist, a lot of residue falls to the floor when you’re spraying it. I’d definitely recommend applying it in your shower or tub. After I applied it I walked around in the shower and the ground felt SO sticky, I could tell there was a lot of product on it. It also stained the bottoms of my feet! Someone even told me I needed to wash my feet because they looked so dark on the bottom. I liked the mist application, because the mist was thick and covered a lot of area at once. The product itself is pretty lightweight, and it feels nice on your skin. With some mists, you need to blend in areas where the product pools up, but this one was so continuous and even that I didn’t need to do that. This Loreal mist dries in less than 5 minutes…it was awesome. I loved that I didn’t walk around feeling sticky or wet for a long time. You can put your clothes on almost immediately after application. I really didn’t like the smell of Loreal Sublime Bronze Self Tanning Mist; it smelled SO strongly of DHA. The bottle says it has a citrus scent, but it definitely doesn’t. To me, the smell resembles cheap self tanner. It smelled bad until I washed it off the next morning. I had a hard time sleeping because I’d wake up in the middle of the night to the strong smell of DHA…ew. On the bottle it says your tan will start to develop within hours. I assumed that meant it would start to develop within a few hours, and then darken over time. So I applied it about 3 hours before a night out, hoping to get a little color. I didn’t see any color change until the next morning! I felt that the directions were a little misleading. When I woke up the next morning I had a medium to dark shade tan, and it looked great. It was natural, smooth and brown. I loved the look of it. It got darker than I thought it would, and that made me happy. Just don’t expect to see any color develop within a few hours! This one lasted about 4-5 days, which is really good. However, it started to get really splotchy around day 2 or 3. So even though my tan lasted 5 days, it didn’t look good for 5 days. I tried to scrub it off around day 3 because it was so scaly looking. Yeah, I think men will like this one, as long as they can get past the super strong DHA smell, and messy application. The color it produced was really nice, and you can’t beat the price. It works out to only $2.39 per ounce, which is really cheap. For what you get, I think that’s a good price for this self tanner. To buy Loreal Sublime Bronze Self Tanning Mist, Click Here. Look and Feel The one is a clear mist spray. Application Applying is easy, but pretty messy! Drying Time It took only about 5 minutes to dry. Smell (After) I still reeked of DHA when I woke up the next morning. Color Produced I got a medium to dark shade tan that was bronze and smooth. How Long It Lasts It lasted about 5 days, but got really scaly around day 3. OK For Men? Yes, I think men will like this one! Price It’s $10.99 for a 4.6 ounce bottle, that’s a pretty good price point!